A quick drive around Gull Harbor on January 28, 2010, found the mute swans doing just fine swimming a short distance out from shore. This pair of swans also had a pair of babies, which are now getting almost as big as mom and pop. 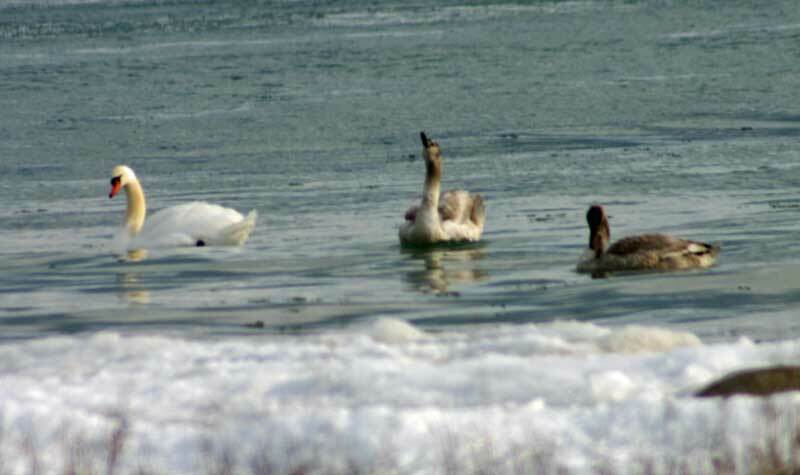 On January 29, 2010, the mute swans were not to be found out on Gull Harbor, but have probably found some open water somewhere. There are lots of wild turkeys around. Sometimes there are very large flocks of them that cross the Kings Highway very close to the Beaver Island Rural Health Center driveway. These turkeys were part of a larger group that had crossed the road before being separated by the traffic on Kings Highway. Yes, the Beaver Island Wildlife Club is alive and thriving. In light of recent questions raised as to our viability we will attempt to bring you up to date. The Beaver Island Wildlife Club has been in existence since the 1940s (it was called a Game Club but later changed to Wildlife). It was organized for charitable, scientific and educational purposes—more specifically to preserve all wildlife on Beaver and Garden Islands. Upon review of years of minutes there is a thread that moves through the years: everything takes time and moves slower than we hoped and every project requires hours of physical labor and/or conferencing. Our concerns include the Double Crested Cormorant (DCCO) overpopulation and its effect on the smallmouth bass fishery; establishing a walleye fishery in Lake Geneserath to augment fishing opportunities; habitat for whitetail deer, grouse and turkeys; management of whitetail deer; and management of the wild turkey population. Our first voiced concerns about DCCO were in 1995. The USDAWildlife Service became involved in 2006 along with our first public hearing on Beaver Island with the state legislature. Because of the undying efforts of the Wildlife Club the Beaver Island Archipelago is now slated to receive the state's largest depredation order in 2010. Data has shown that this type of control in the Les Cheneaux Islands has seen a return of their perch fishery. 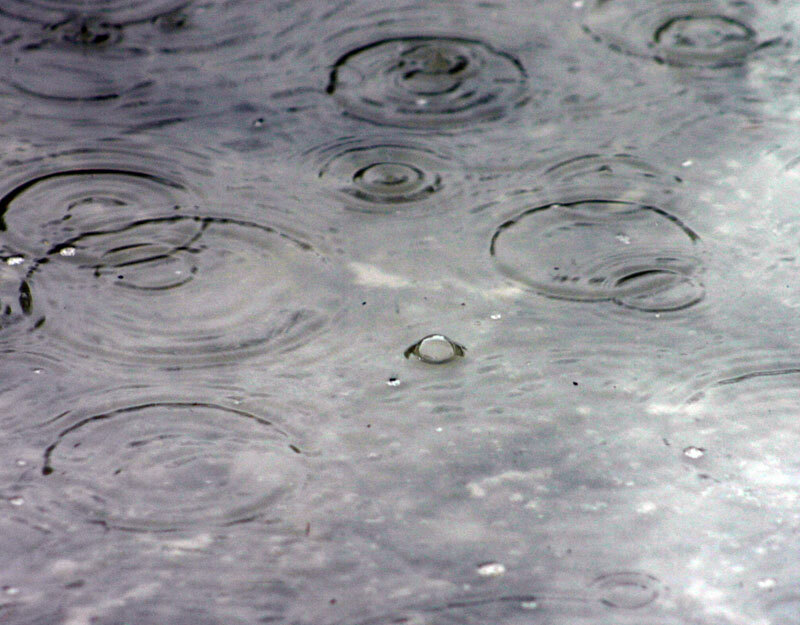 We hope to see the smallmouth bass fishery recover in much the same way. This was only accomplished by countless hours of commitment on the part of our members and many trips by our president, Jeff Powers, attending meetings in Lansing. DCCO control in addition to our club's successful effort to get the opening of smallmouth seasoned changed to July 1 st in 2001 will add to the recovery of the fishery. The conception of walleye rearing began in 2000. Original sites and plans had to be discarded but the pond became a reality on property on lease from Jon Fogg. The first fry were released in the pond in 2003. The BEACON did a very fine article on the project. Bill writes that four members rose to the challenge and spent 10 hours a day for 5 days shaping a half acre hole in the ground to fit the requirements. Twenty two volunteers showed up to put the liner in place and 16 students with Jim Gillingham finished the work with shovels and rakes. Habitat for wildlife has always been high on our list. We requested clear cutting as early as 2000 but it wasn't until 2006 that the first clear cutting was done near camp #3. According to Brian Mastenbrook the DNR would like to do 100-150 acres per years but we have not seen that forthcoming. In 2005, the last time we had a DNR officer here to do deer checks, he told us he was going to push for timber harvest. In 2003 the DNR sponsored material for 8 acres of food plot planting. We have encouraged private owners to establish food plots on their acreage and that has moved along but we could use more. When it comes to management of whitetail deer on the Island it seems that wildlife biologists we never knew existed come out of the woodwork. Even the experts disagree but most do agree that island management is special—much different than mainland management. 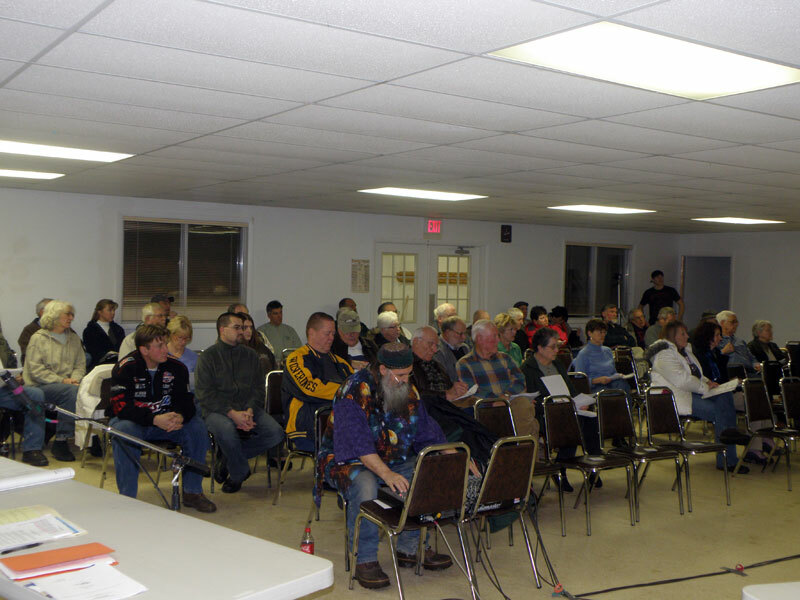 In 2005 we sponsored a Quality Deer Management (QDM) discussion at Peaine Twp. Hall. Perry Russo, North Central Regional Director spoke about measures aimed at improving herd quality. Following this the club decided to implement a volunteer effort to encourage non-harvest of small bucks in a campaign to “let him go-let him grow”. As of late most landowner deer hunters have implemented their own regulations to take only bucks that have at least 3 points on one side. The consensus was to keep it voluntary. To further compliment the liaison we have established with the DNR mostly through Brian Mastenbrook, we do yearly deer drive by census and check our own deer by our trained volunteers, mostly Jacque LaFreniere and Jeff Powers. We have been praised by the DNR for the information they have received from us to help them determine health, population and the future of the deer on this island-they never had access to this kind of information that we are gathering. 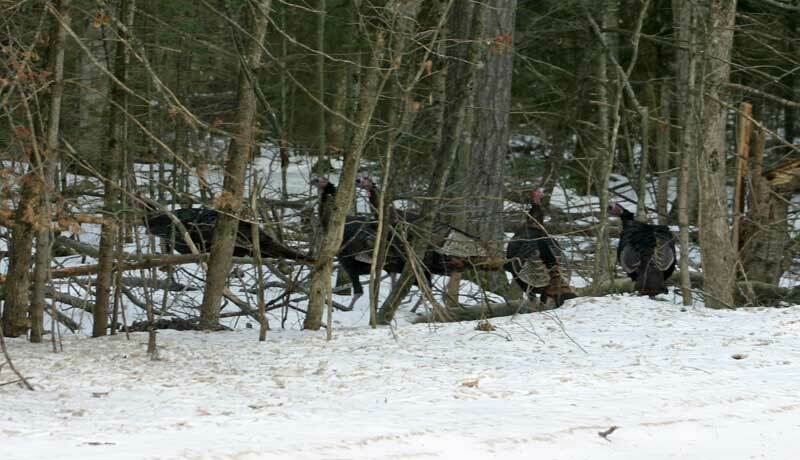 Wild turkeys were reintroduced in 1995. The population is now estimated at nearly 800. They require complementary feeding in the winter which we have assumed. The first year we provided 1000 #s of corn. We now purchase and distribute 10 Tons of corn in the winter to our feathered friends. We encourage more turkey hunters to reduce the population. Last November we celebrated our first annual Harold Lounsberry Memorial Hunter's Dinner at the Shamrock. Proceeds of the dinner will be matched annually and given to the 21st Century Scholarship at the BI Community School. So you see, we are well and living here on BI. We are a dedicated group of non-residents and residents who have the Island's wildlife at heart. We need to protect those things that we hold dear and continue to work hard to preserve them. Candidates for the Board of Education have until 4 p.m. February 9, 2010, to register with the St. James Township Clerk’s office. One four-year term will be up for election at the annual school election on May 4, 2010. Incumbent board member and board treasurer, Barbara Schwartzfisher is planning to run for reelection. Other interested candidates must be registered voters of the school district and file a nominating petition with signatures of at least 20 voters or a $100 filing fee. Petition packets can be picked up from the St. James Township Clerk or from the school office. 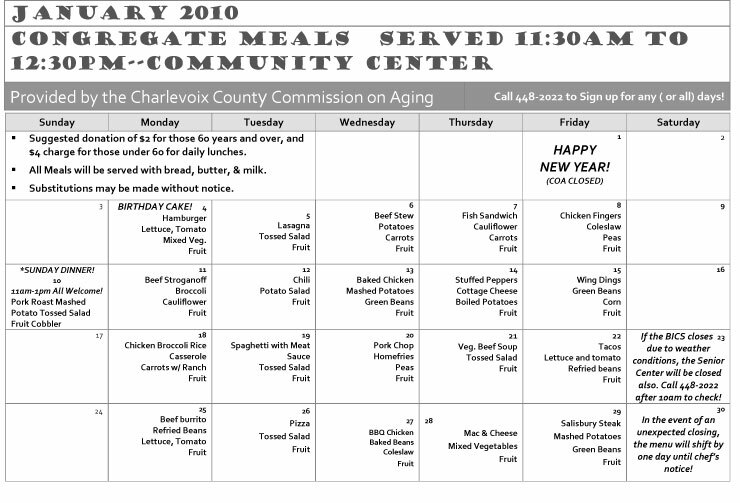 Tuesday, January 26, 2010 at 1 p.m. This presentation took place in two locations simultaneously. Location one was the Charlevoix Area Hospital in Classroom B on the lower level. 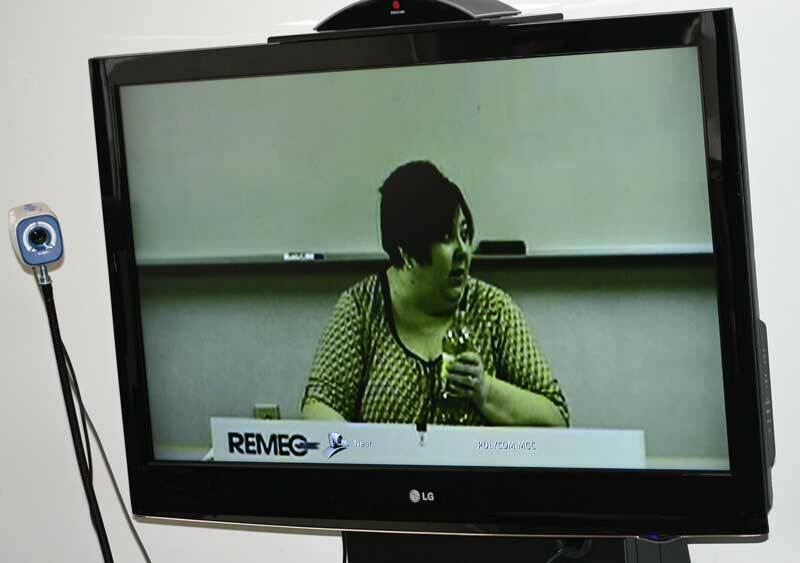 Location two was at the Beaver Island Rural Health Center in the their education room via the REMEC TeleHealth Network. "In the Groove, Alzheimer's disease: What Everyone Needs to Know was presented by Lisa Tegals, LLMSW, who is the program coordinator of the Northern Region Alzheimer's Association-Great Michigan Chapter. The presentation provided information about the ten warning signs, assisted attendees with decision making about when to seek medical advice and treatment, introduced attendees to activities that help to maintain optimal brain functions, and attendees had the opportunity to engage in a discussion of their concerns for themselves and their loved ones. Approximately 20 people attended this presentation at the BIRHC Education Room, and when you added the BIRHC Manager, the Community Center Manager, the press, and a technical consultant, the total went up to 24. The REMEC network helped make this program possible with use of the Internet connection at the BIRHC as well. The presentation was very personal as well as informational. The presenter was knowledgeable and empathetic. All in all a wonderful, informational meeting was well-attended. This program was jointly sponsored by the CCCOA, and Alzheimer's Association of NW Michigan, and Charlevoix Hospital. Alzheimer's disease is the most common dementia. Dementia means that you don't know that you've lost your memory. Medically, you don't know how to get home, you don't know where you are, you don't know what day or what time it is, and the last to go, you don't know who other people are. "If you forget to remember that you forgot," you probably are having some serious dementia issues, but forgetfulness is a normal part of aging. Stress can bring on the forgetfulness related to aging. Some of the first signs of Alzheimer's disease include forgetfulness with the inability to retrace your previous steps, poor judgement, a serious change in mood or personality, and a withdrawal from work and social activities to protect your dignity. The cruelest of all symptoms of Alzheimer's patients is when the personality changes from positive to all negative--anger, frustration, and poor unacceptable language. If the patient doesn't know who you are, it's okay to play the role they assign you. One of the recommended readings was a book entitled "Measure of the Heart" by Mary Ellen Geist. Genetic testing can diagnose early onset Alzheimer's disease before the age of fifty, which makes up about ten percent of the cases of Alzheimer's. Contrast is very difficult for Alzheimer's patients. The example given was that a clear glass of water might not be able to be seen by the patient. Smoky colored glasses are much easier to see. Also black may signify a hole to an Alzheimer's patient, so black tiles might cause the patient to think they could fall into a hole. While some get bent out of shape by one sentence of a particular opinion statement and can't seem to see the substance, I prefer to look at the whole thing, and then step back away from what I've read, take some time to roll it around in the big, empty space between my ears, and then I go back and read it again trying not to put my own negative emotions into what I've read, but, instead, try to purposely take the writer's side, and see where that takes me. Here is an example: Fred got his job because he knows Joe.  FRED (I don't like Fred) got HIS job because he knows JOE (I'm not sure about Joe).  Fred (the lucky stiff) got his job (only) because he knows Joe.  Fred got his job BECAUSE (and only because) he KNOWS (his best friend) Joe. So, the next time you read something, perhaps you should take a few moments and try to empathize with the writer. Perhaps, try to look at the writing from a different perspective. Perhaps, just once when reading something that makes you mad, try to pretend that the writer is your best friend and you know that (s)he would never write something purposely to inflame you. Perhaps, take some time to think about what was written. Perhaps, try to leave out your negative emotions. Now, writers, if your purpose is to inflame, then quit beating around the bush. What are you trying to say? In other words, you should fill in (like the parentheses above) in your writing with introductory statements, attempting to show your position and the reasons for that position. Knowledge is power, but meaningless and worthless, without communication of that knowledge. Suppose some doctor in a little country in Africa accidentally stumbles upon the cure for the most menacing disease on earth. He has the knowledge. The question is: How will the knowledge get to the rest of the physicians on the planet? Will the knowledge get to them? Will they accept this knowledge and move forward to prove that it is accurate or false? OR Will they be so enflamed, because some unknown African doctor has claimed something that they could not have discovered because they were too busy, that they will not do anything with the knowledge? Communicate for the benefit of the entire Island. - Establish the Beaver Island Wildlife, Forestry, and Fisheries Endowment (BIWFFE) as a sustainable income source supporting the mission of the BICC. - Rehabilitate, expand, maximize, and sustain the Whitetail herd thru Quality Deer Management initiatives and cooperation between private land owners and state / local agencies. - Rehabilitate, expand, maximize, and sustain the world class Smallmouth bass fishery through regulation ensuring sustainable harvest and adequate populations of fish. - Rehabilitate, expand, maximize, and sustain native fish (Lake Trout, Brooke Trout, and Perch) and fish spawning areas on Beaver Island and within the Beaver Archipelago. - Rehabilitate, expand, maximize, and sustain native upland bird habitat on Beaver Island. - Develop, maximize, and sustain Brown Trout fisheries in the Beaver Archipelago. - Develop, maximize, and sustain Steelhead Fisheries in the Beaver Archipelago. - Expand, maximize, and sustain the wild turkey population in the Beaver Archipelago. - Serve as an island liaison to state and national governmental agencies and private conservation agencies on wildlife, forestry, and fisheries issue affecting the Beaver Archipelago. - Serve as an umbrella organization of Island chapters of national hunting, fishing, conservation, and conservation, and forestry organizations including, but not limited to, Quality Deer Management Association, Trout Unlimited and Ruffed Grouse Society. The BICC will launch its efforts by hosting the Quality Deer Management Association (QDMA) on Saturday, March 6th. Bob DuCharme, QDMA Director for the Great Lakes Region, will speak on the issues facing the Whitetail Herd on the Beaver Island and the important part that Quality Deer Management can play in rehabilitating and expanding our deer numbers, health, and size. A public informational session will be held from 4-6 pm at the Beaver Island Community Center. The Beaver Island Conservation Club will look to establish a QDMA branch on the island during 2010 and work with the Michigan DNR to establish regulations supporting that effort. Detailed information on the Quality Deer Management Association can we found at www.QDMA.com . The BICC will also be initiating a fund raising effort to support the Beaver Island Wildlife, Fisheries, and Forestry Endowment (BIWFFE). The BIWFFE is intended to become a renewable source of funding supporting the mission of the BICC. As a non-profit wildlife organization the BICC will have the ability to petition for state, federal, and private grants as well as raising funds thru private donors. Erin McDonough, island native and Executive Director of the Michigan United Conservation Club (MUCC) states, the “MUCC appreciates the passion and enthusiasm that one of our newest affiliate clubs, the Beaver Island Conservation Club, is showing in promoting our outdoor heritage in Michigan. We welcome them aboard and look forward to working with them.” The BICC looks forward to working with the MUCC, as well as the newly revamped Michigan DNRE, to maximize the support for Beaver Island and its surrounding waters. Please visit our website for membership information as well as up to date information on meetings, events, and BICC initiatives. The website can be found at www.beaverislandconservation.org. You can also contact BICC leadership at the following email address and phone numbers. Please contact the above mentioned individuals with any questions regarding this press release or the Beaver Island Conservation Cooperative. BIEMS functions under the authority of not only the two townships on the Island, but also medically functions as part of the Charlevoix County Medical Control Authority (CCMCA). Because of the island's unique location several special treatments have been authorized. In order to qualify for those special treatments, the BIEMS members must complete an 8-hour training program. This program was completed on January 23 and January 24. The training includes programs in Patient Assessment, Cardiac Emergencies, Pharmacology, and Respiratory Emergencies. Joseph Moore, developer and instructor for the program stated, "If a participant wants to be certified by my signature to provide these treatments, then they must demonstrate the knowledge and the skills necessary to provide them." All participants in Friday's and Saturday's program were certified. Congratulations to all participants for completing this required special training. When most of the Islanders would like to be out snowmobiling, skating, and/or snowshoeing, we find ourselves in the middle of a warm downpour that is melting the snow and making the ice even more treacherous. Last year at this point, the Grand Marais Polar Bears were not able to come to the Island to play in the scheduled basketball game due to bad weather in the UP. Yes, this is a puddle on top of the ice. And .....is it ever slippery underneath! When reports come in like this one, the editor jumps in his car and begins driving quickly to the location. Yes, there really was an eagle on the ice, and, amazingly, it was still there. Most of the time, we are a "day late, and a dollar short." Today was not one of those days. 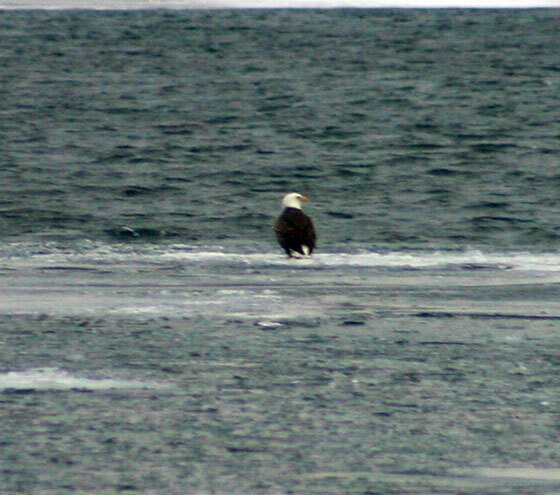 The eagle was, in fact, on the edge of the ice by the open water as you can see by the first picture above. This mature bald eagle was also very wary. One picture was taken from the public beach parking lot, but almost as soon as the car door opened, the eagle decided that the human was too close and paying too much attention. 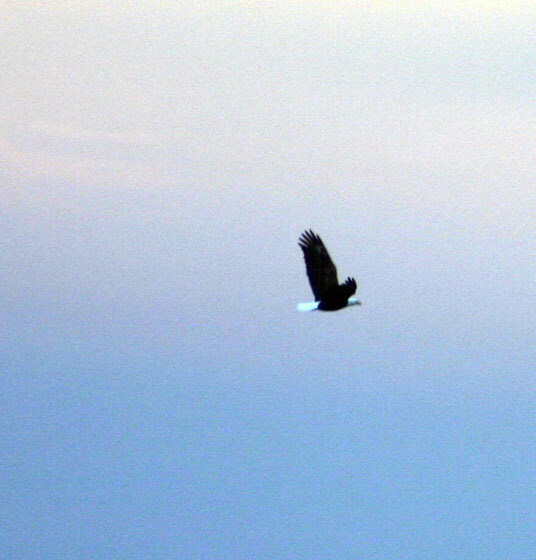 The eagle immediately took flight and disappeared. There was no time to set up the tripod, no time to get a really good focus on the camera, and no time to think about videoing the eagle as it took off. An open message to the people of Beaver Island. There has been a lot of information and misinformation lately regarding the state of property assessments on Beaver Island. has become far too stressful for me now to not speak. accurate, but the specific information used to back that up is still on hard cards and handwritten form. This is unacceptable to the State in the age of computers. automatically converted. I had previously worked five years in the old system to bring that information up to date, only to find myself having to start over. photographs of every building on the island since the new program allowed for only digital pictures. supervisors I was told that it would be difficult to get any more compensation from the Townships Boards. Knowing the need, I continued to press and a couple of years ago the St. James Township Supervisor took over the project telling me that it would be easier to concentrate on St.
he took it upon himself to carry the ball. one. In fact it was worse than square one because now I suddenly had two new Supervisors in office that knew nothing of what had transpired over the past 3 years. Their Boards were also in the dark. Now the State has come in and said this information must be entered by March 2011, and they don't care why it hasn't been done. that now taxpayers will pay much more than I would have charged to get the same job done. employment with St. James Township would be terminated as of March 31, 2010. The Beaver Island Human Services Commission is seeking individuals interested in forming a steering committee for the purpose of developing a Human Services-Health Fair for the Fall of 2010. Please contact, Pam Grassmick 231-448-2314, 248-489-0784 or e-mail: mcgrass@ameritech.net. 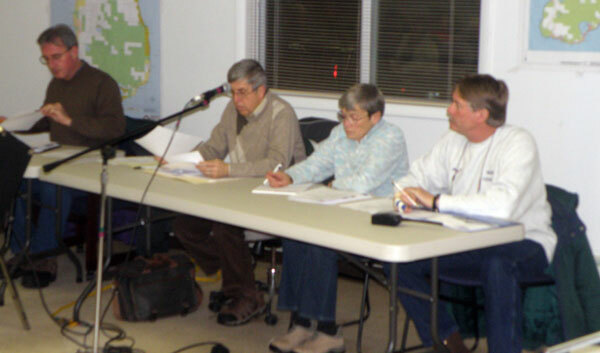 The Beaver Island Chamber of Commerce adopted three resolutions at the January meeting of the board of directors. “The Beaver Island Chamber of Commerce endorses adoption of Quality Deer Management as defined by the Quality Deer Management Association.” See www.qdma.org for details. Kathy Speck and Steve West were reelected to new terms as President and Secretary / Treasurer. Angel Welke was elected Vice President at the January 11 meeting. Directors are elected by members to three year terms and they select officers for one year terms. Treasurer Steve West reported that despite the challenging economy membership renewals were coming in at a faster rate than in prior years and the groups cash on hand was the highest ever at year end. (231) 547-8906 or by email: kjacobsen@cah.org Walk-ins are always welcome. It is our understanding that the Beaver Island Broadband Inc (BIBI) application for round 1 is still pending with both the USDA (BIP) and NTIA (BTOP). Although the round 2 window is open the round 1 window has not been closed. Few dollars have yet to be awarded in Michigan Round 1. The BIBI group has done of good job in framing the need. Working with CCC they have created a certfied solution that meets your communities needs and will create needed competition and increased capacity. We remain hopeful that the BIBI application will be awarded, we must continue to wait on the USDA and NTIA. As with any government program each published change provides additional insight on what the awarding agency considers a high priority. The Round 2 NOFA (Notice of Funds Available) reinforces many aspects of the BIBI round 1 application. Collaberation, anchor institutions, remoteness, community focused and Best practice solution for the applicants service region. These round 1 implied attributes are reinforced and highlighted in the round 2 rules. These were included in the original round 1 BIBI application. Beaver Island and the leadership team have developed a solid plan for meeting the islands sustainable broadband needs. We are excited about the positive economic impact this project will bring if awarded. CCC and theirpartners look forward to playing a key role in this collaberative delivery. From what we can determine the BIBI leadership team has done all the proper steps to ensure the greatest level of success. If for whatever reason the round 1 application is not accepted by BIP (USDA) and/or BTOP (NTIA) there should be sufficient time to make any identifed changes in the application and resubmit for round 2. If a reapplication effort is required CCC is willing and able to assist BIBI in that effort. It is too early for that detailed discussion and our energies remain focused on round 1 funding. Additionally, if round 1 is not successful private equity should be a viable discussion. Do not hesitate to contact our office for information. The Commerce Department's National Telecommunications and Information Administration (NTIA) and USDA's Rural Utilities Service (RUS) announced availability of $4.8 billion in American Recovery and Reinvestment Act (ARRA) grants and loans to expand broadband access and adoption in America. This is the second funding round for the agencies' broadband programs. NTIA and RUS also announced the rules for applying in this funding round, which have been modified to make the application process easier for applicants and better target program resources. The rules are presented in two separate but complementary Notices of Funds Availability (NOFAs) that promote each agency's distinct objectives. The agencies plan to accept applications from February 16, 2010, to March 15, 2010, and announce all awards by September 30, 2010. With the majority of the excitement for the week happening on Monday at the Joint Township meeting, there were only a few interesting items to discuss at this Peaine board meeting. 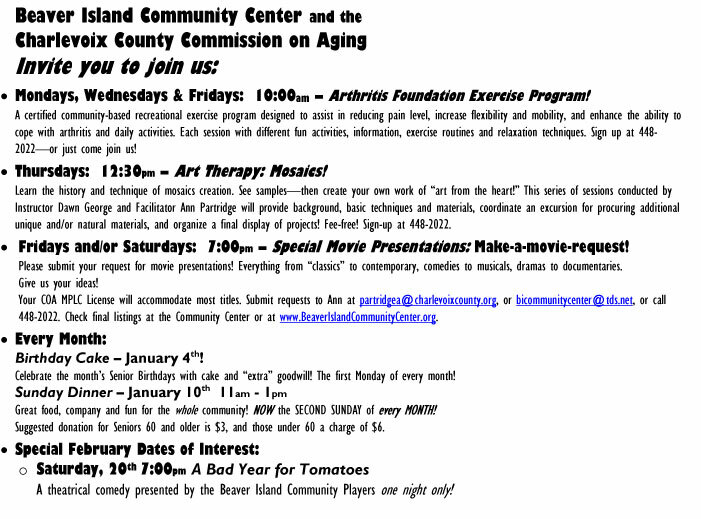 There were corrections made to the December meeting minutes, Pete LoDico was appointed for at two year term to the BIRHC board, Jack reported on the Monday Joint Meeting, Jack Gallagher reported on the Tax Commission issue, Colleen Martin asked questions about the appraisal, who would be paid, and what went wrong before, Kevin White answered a question, and the issue of responsibility for this problem was discussed. The meeting ended with the approval of the bills and the designation of Pete and Sandy LoDico to write up a posting for cleaning of the Peaine Hall. The meeting again started and ended on a controversial note. There was disagreement at the beginning about the reason for the meeting. Jack Gallagher had prepared a paper listing several questions that he felt needed to be answered. Don Vyse and other airport committee members (those not on the two township boards) stated that they did not have the information available to answer these questions, and, rather than guess, they were not prepared to answer them. Don, and Mike Scripps agreed, that some of these questions would take research. Jack Gallagher countered with a statement that suggested that anyone involved in the airport expansion project should be able to answer the questions presented. "Not on 10 minutes notice, no," Mike Scripps commented. Don Vyse had believed that the meeting was about the land acquisition, not about answering the topics of these questions. So began another contentious, and over two hour, meeting. What was the outcome, the bottom line, of the meeting? Both township boards agreed to form a committee made up of two St. James Township Board members, two Peaine Township Board members, and the law firm representing both townships to work out a legal and formal airport authority, OR to hammer out an agreement between the two townships on all aspects of the airport committee. Those members on this committee are Jack Gallagher, Paul Welke, Rick Speck, and Ray Cole. While awaiting the group who will govern the airport, a motion was passed by Peaine, agreeing with the St. James' board's motion, to allow Don Vyse, current airport committee chairperson, to continue the day-to-day operations and decisions regarding the airport. The above was the entire accomplishment of this over two hour meeting, but before getting to this point, there were many rather heated, emotional comments by many members of the public, as well as the airport committee. Don Vyse took over thirty minutes to enumerate and explain the actions taken by the current airport committee over the last ten years. He explained that all of these actions were voted on by both township boards, which signified their approval. From 2001, where Don began his enumeration, to the current land acquisition issue, Don stated the approval of both boards of all airport committee suggestions to those present. The most important question was answered. Why is the property acquisition necessary for the Beaver Island Airport? Don Vyse stated that the committee and the townships had basically two choices, the first one nothing that the committee or the board would probably want to do. The Michigan Aeronautics Commission had provided these options to them. Either shorten the existing runway and spend $50,000 to move required equipment at township expense OR obtain the property and make the property conform to the regulation regarding the proper approach requirement for the 4300 foot runway. (The BI project was part of the commission's minutes. You can read them here. ) To make this simple, the reason for the property acquisition was to be able to trim the trees down to make the 4300 foot runway conform to federal and state regulations relating to the approach from the west end of the runway. Mr. Vyse went on to explain all the actions taken by the airport committee, along with all of the votes by both township boards for the last decade. He stated that the new terminal building was just one part of the five year plan, which was required to be placed in a ten year plan by the Michigan Aeronautics Commission. The issue of the runway was required to be addressed. The other aspects of the plan including the building would cost the local taxpayers just over $25,000 according to Mike Scripps, and the townships would get a million dollars worth of building for this 2.5% local contribution. More story and video clips will be forthcoming. Complimentary Hot Chocolate, Coffee & Cookies for all! Each child will be given free tickets for the games! Please help our Beaver Island birdie friends by building a home for them. Power’s Hardware and the Community Center. The spec sheets are only a possible guide to assist you. You can build whatever style birdhouse that you wish. You are only limited by your own imagination! 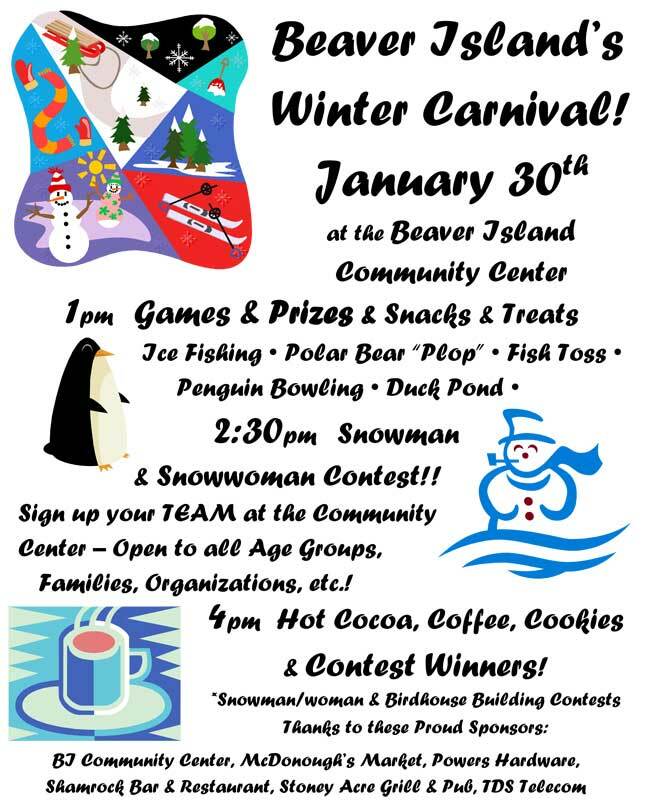 All entries must be submitted to the Community Center no later than 1/28/2010. for later placement on the trails. Dinner for two, a $30.00 Power’s Hardware Gift Certificate and a $25.00 cash prize. SECOND PLACE PRIZE is Dinner for two, a $20.00 Power’s Hardware Gift Certificate and a $15.00 cash prize. THIRD PLACE PRIZE is a $25.00 cash prize. and the Beaver Island Community School. The Beaver Island Community Players will present “A Bad Year for Tomatoes” on Saturday, February 20, 2010, at 8 p.m. at the Beaver Island Community Center. The comedy takes places in a rural community on the East coast and is full of funny, quirky characters that Islanders will love. In the spotlight are: Jan Day, Jeff Powers, Phil Becker, Bob Bass, Joan LaFreniere Banville, Wendy White, and Elaine West. The production is being directed by Jacque LaFreniere, and assistant director is Lisa Gillespie. Tickets are $10 and available at the Community Center. Lansing, Mich. (Jan. 13, 2009) – With only a month left to enter, thousands of Michigan consumers have learned that a chance to win free groceries for a year is just a mouse click away. In fact, since the Michigan “Farmers Feed US” promotion at FarmersFeedUS.org launched on Nov. 15, Michigan consumers have registered more than 115,000 times for a chance to win. Through Feb. 12, Michigan residents can register at www.FarmersFeedUS.org for a chance to win one of three grand prizes of free groceries for a year*, courtesy of Michigan’s farmers. Upon visiting the site, consumers can choose to register with each of 10 Michigan farmers daily, and take a video tour of their farms. Each video explains how they produce safe, nutritious and affordable food for Michigan consumers. The agricultural commodity organizations sponsoring Michigan Farmers Feed US selected the farmers featured on the Web site, with the goal of showcasing farmers who are representative of the different food groups and different farming regions in Michigan. The Michigan Farmers Feed US program is supported by local farmers represented by the Michigan Ag Council, Michigan Farm Bureau, Michigan Beef Industry Commission, Michigan Pork Producers Association, Corn Marketing Program of Michigan, Michigan Soybean Promotion Committee, Michigan Apple Committee, Dairy Farmers of America, Michigan Milk Producers Association, United Dairy Industry of Michigan, Michigan Allied Poultry Industries, GreenStone Farm Credit Services, West Michigan Ag Alliance, Hamilton Farm Bureau, and 30 county Farm Bureaus from across the state. Further, Spartan Stores is the official retail partner, helping connect their consumers with farmers from across the state. The Farmers Feed US program originated in Michigan based on interest from the Michigan Ag Council and other agricultural organizations in coordinating a statewide effort to showcase how Michigan's farmers produce safe, nutritious, and affordable food for consumers. Michigan is the second state to implement the nationally-based Farmers Feed US program on a state level. *Based on FMI, a $5,000 value. 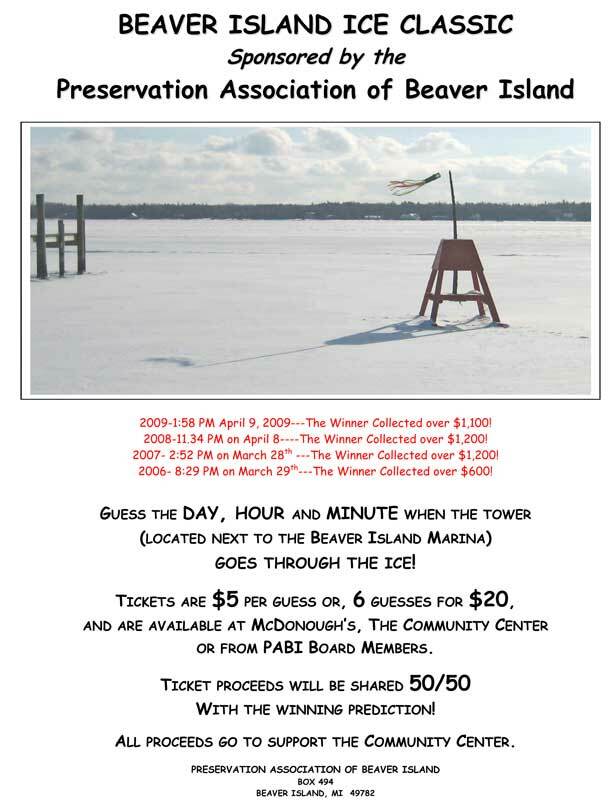 Meeting to help out those that can get to the mainland is scheduled for Wednesday, February 3, 2010, in Petoskey. 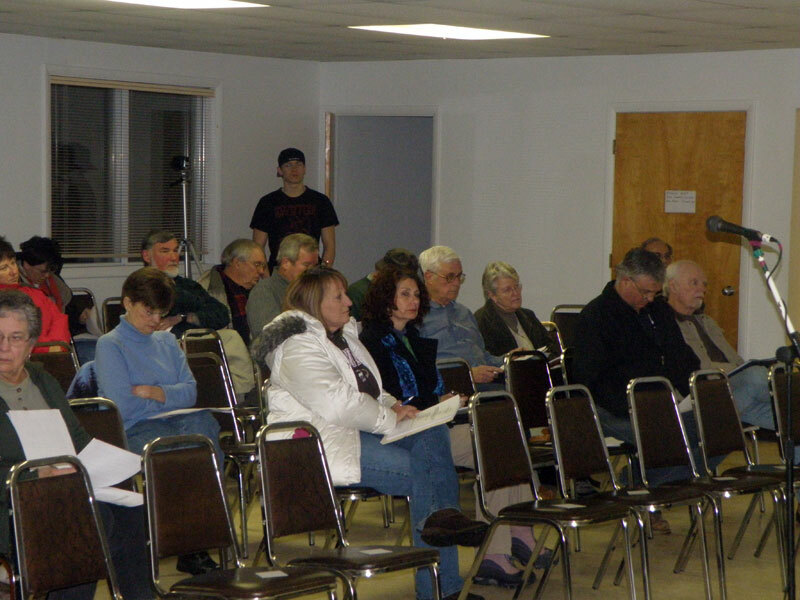 At the St. James Township meeting last night, January 6, 2010, the St. James Township Board voted to seek off-Island bids for the purpose of getting the re-appraisals completed to satisfy the State of Michigan Tax Commission. In a unanimous vote, the board decided to send out five requests for proposals to five off-island firms. In a packet of information and letters handed out at last night's meeting, Rick Speck, St. James supervisor, had prepared a plan and submitted it to the State Tax Commission. This plan will require the township to "send out RFP to conduct a complete reappraisal of all parcels in St. James Township. The appraisal is to be conducted by a certified assessor/appraiser approved by Larry Griggs of the State Tax Commission's assessment and certification division.....The current assessor will be retained to complete the 2010 assessment roll." The plan submitted by Rick Speck's letter of November 16, 2009, and in a reply from the secretary of the State Tax Commission, "Your plan is accepted as submitted. We will schedule a follow up review for after the March 2011 Board of Review. We will ask Mr. Griggs to conduct periodic reviews to make sure the Township is progressing and will successfully complete your reappraisal." In a question and answer period following the decision made at the meeting regards this reappraisal, the taxpayers were assured by the Board that only those improvements that have not previously been logged will possibly cause an increase in taxes. Those who have built additions and additional buildings on the property may end up with a higher taxable value. No matter what, it will cost the St. James taxpayers somewhere between $30,000 and $56,000, hopefully split up over the next two or three years, to get the job done. It would cost a lot more than that if the State of Michigan came in and took of the tax rolls, and re-appraised the property using their employees. The award(s) will honor an individual, couple or community organization that has made a significant contribution to making Beaver Island a better place to live, work or visit. 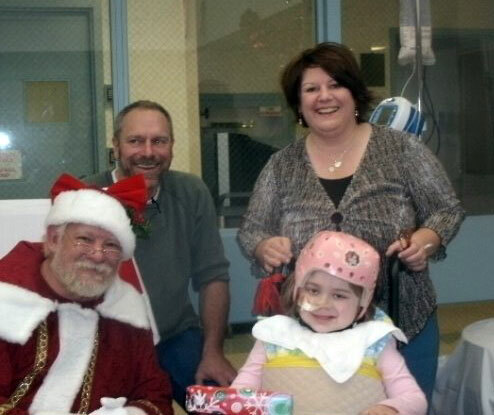 1/24/10 It was reported on facebook that Emmalee was able to walk over 200 feet. We BELIEVE! 1/15/10 Reported that Emmalee walked 100 feet and is continuing to progress. 1/12/10 KK reported that Emmalee walked thirty feet down the hallway. This is amazing progress, and all the thoughts and prayers are working. 1/10/10 Emmalee has been at Mary Free Bed for one month, and she is making good progress. Her mom reported that she is attending school there at MFB. 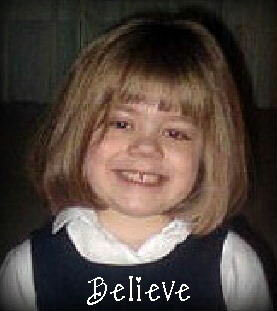 We all look forward to the coming day when Emmalee will be able to come home, but no one knows when that will be. We will continue to update you as the information comes in. patient@maryfreebed.com and put Emmalee Antkoviak in the Subject. There are quite a few subscriptions that will expire or that have already expired in February, 2010. We appreciate your support and ask you to renew your subscription as soon as possible. Emails have been sent out, but quite a few have been returned without delivery, which means that BINN does not have your current email address. JULY 15, 16, & 17 Mark your calendars! Children 12 & under are always FREE! An afternoon of winter fun! Games and prizes and snowballs and snowmen and snowwomen and snow forts and snacks and treats and hot chocolate and red cheeks! Come join the fun!